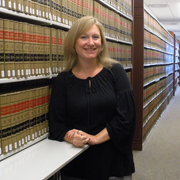 As the Gould Law Library’s Digital Archivist, Laura manages the Library’s Digital Commons initiative, which promotes open access to the scholarly writing of the Touro Law Center faculty, as well as the Touro Law Review. In addition, Laura teaches New York Legal Research and appears as a guest lecturer in various courses. She also creates library guides and regularly provides assistance in the Reference Office. Laura joined the Library Faculty of the Gould Law Library as “Reference Librarian & Library Webmaster” in 2010, after serving as a library science intern here in 2009. As Library Webmaster, she was responsible for maintaining the library’s web pages and social media accounts. Prior to becoming a law librarian, Laura worked for the New York City Law Department and Legal Services for New York City, as well as interning at the Environmental Protection Agency.